As writers we all aspire to produce great literature. But what, precisely, does that mean? According to Merriam-Webster, one definition is: written works (such as poems, plays, and novels) that are considered to be very good and to have lasting importance. It’s that last bit, about lasting importance, that carries the rub for contemporary writers. How old will we be when we see the physical evidence of that? Perhaps, if a writer is clever enough to produce high quality work in his or her twenties, by the time he or she is my age it might be clear. If he or she has won a Pulitzer or Nobel prize, for example. What about the late developers? Those who produce their best work in their middle years and then, sadly, die relatively young. They will never know. Of course, there are those who claim the ability to make that judgement without waiting for posterity. Those who award the great literary prizes are chosen for their own widely acknowledged expertise as writers. Readers, on the other hand, may not share their opinion. 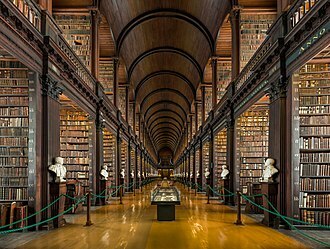 Dublin has been chosen as a UNESCO ‘City of Literature’. On it’s website you are sure to find references to James Joyce and other Irish literary giants. Widely acknowledged as a writer of genius, it remains true to say that few people have read his works from beginning to end. Most general readers with whom I’ve discussed the subject admit having been unable to get beyond the first few pages of Ulysses. It seems to me that the function of literature is to enable the reader to see some aspect of life through different eyes. To make him or her shake his or her head and say ‘Wow! That’s really opened my eyes’. By franklparker in General posts on April 14, 2016 . My fave is The Lord of the Rings. The writing, the themes, and the story’s richness all give it lasting significance. I feel the same way about Gone with the Wind. In time your masters thesis might enter the category! Congratulations!